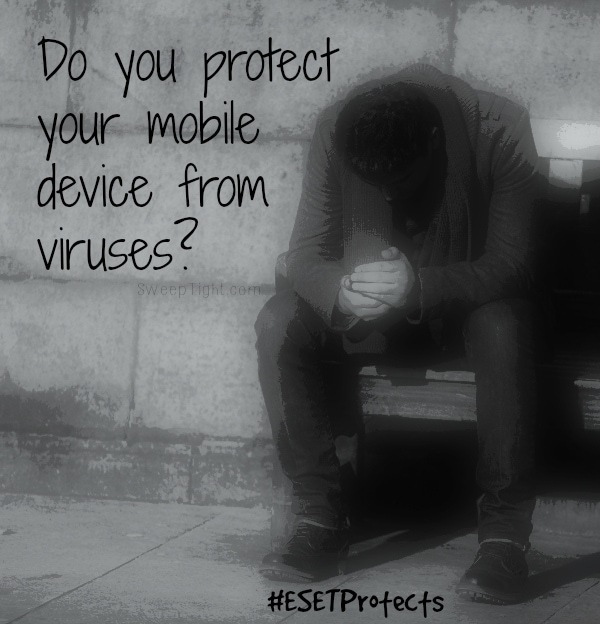 Do you even think about protecting your phone or mobile devices? I swear my phone is practically more powerful or as powerful as my desktop PC. Which is why I am now using ESET Mobile Security. I received a free subscription and compensation to facilitate this review, but all thoughts and opinions are my own. I have a Samsung Galaxy S5 and absolutely love it. I can seriously do everything from shop online, check emails, manage all my social media sites simultaneously, to photo editing like a pro. This device has honestly become my right hand. As a blogger, mom, full time student, and just plain member of this generation, I am lost without my phone. Let’s face it, most of us have been seduced by convenience and are now stuck in its trap. I cannot imagine what I would do if my phone got a virus or my information wasn’t safe. Which is why I’m so relieved that ESET now offer mobile security. I have been using ESET Virus Protection on my PC for years and have never had any issues. In fact, the other 4 computers in the family had horrendous malware and virus problems in the past year and mine was totally fine. I’d like to report that downloading this app from the Google Play store took all of 3 seconds. I simply scanned the QR code (you also get a 30 day free trial) from my desktop and it automatically downloaded to my phone. And, I can install this on 5 devices on the same Google account! Now I don’t have to worry about the kids’ devices either! from viruses when downloading apps, files, images, etc. 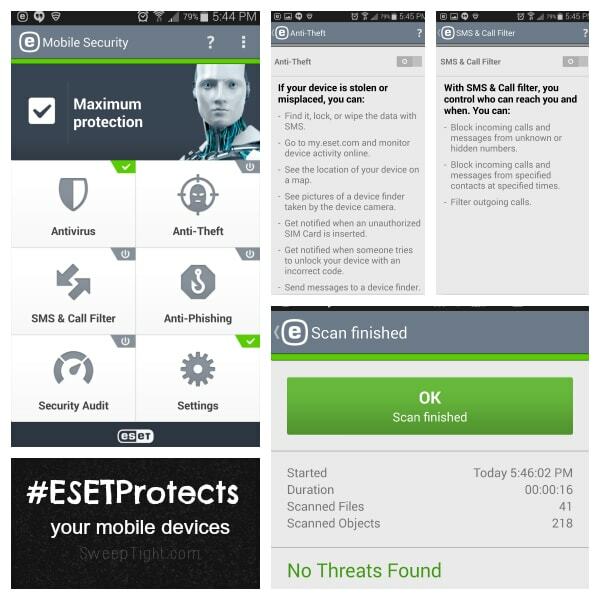 Right now you can get ESET Mobile Protection for 75% off! For a limited time, you can get this awesome mobile security for just $4.95 for the year! 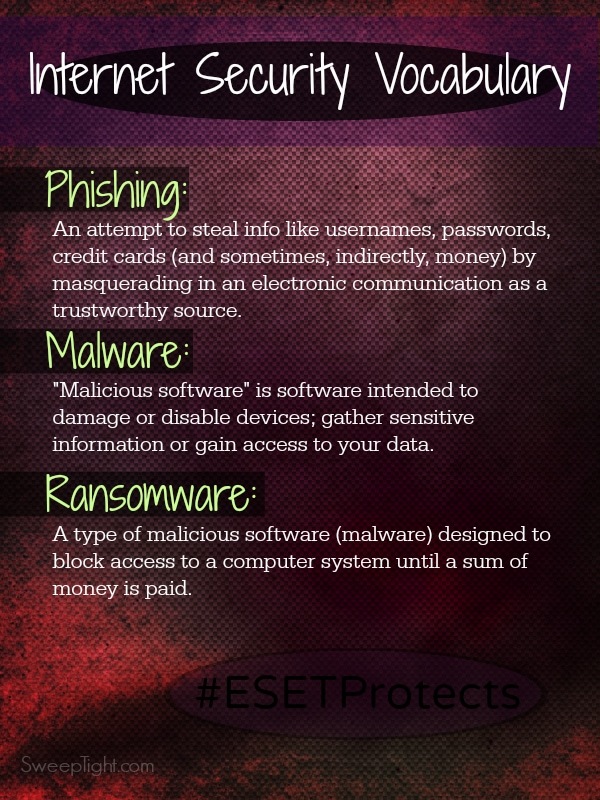 Find ESET on Facebook and Twitter! I don’t use my phone to access any banking information nor do I make any purchases with it. Um…I don’t keep my stuff safe when I use my smartphone. I really didn’t think about it although I should as like any computer, viruses and hacking can occur! I try to keep my information safe on my cell phone, by being very careful about what websites I visit from my cell phone. I never shop from my cell phone. I don’t shop online or do banking. I use it for texting or email only. I don’t use/do that kind of stuff on my smartphone. I just don’t trust it! I don’t use my smart phone to do any banking or purchasing. I don’t tell anyone my passwords or codes. I don’t do important things like that on my phone! I never pay any bills or buy anything off of my phone. I password protect everything and have a security program on it from verizon. So many places being hacked lately. Scary. I wish it wasn’t so complicated to protect oneself. I do not pay any bills or shop anything off of my phone. I cant tell that lol..it is hard, am looking for something good. I don’t use my smartphone for anything that would need to be secure. I just use it for phone calls, GPS and a little surfing. I dont use my phone for banking! I try to keep my phone safe and secure by only using it for calling and texting mostly, anything above and beyond I go to my Desktop which is very secure. Thanks! I don’t have a smartphone, so it isn’t an issue with me. I don’t use my mobile devices to access secure info, like banking or shopping apps or websites. Prior to now, I hadn’t been aware of any protection options! at this time my husband and I don’t do online banking or shopping from our phones for that reason…. however we’d love to, but were not aware of mobile options of virus protection. I don’t use my phone for banking or shopping. My info is very secure: I don’t have a smartphone. I never pay any bills or buy anything off with my phone. i clea my brower history regularly, clear caches, and try not to view/use banking info. I am vulnerable to everything out there because I have not loaded any security protection on my phone. I am new to the whole smartphone do’s and don’ts. I will be getting some protection in the very near future!! I really haven’t done anything to keep myself safe except trying to be careful. It’s confusing & I really need to do something about it. I use a password and don’t buy anything on my phone. I don’t use my smartphone to purchase anything online. I use my desktop.